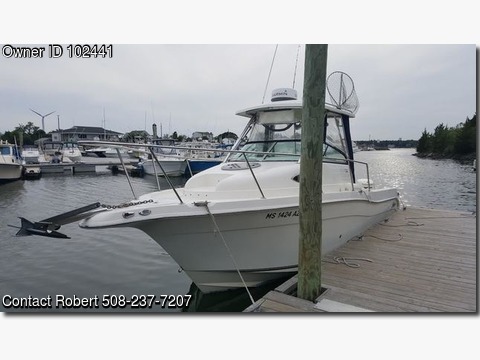 Please call boat owner Robert at 508-237-7207. Boat Location: Buzzards Bay, Massachusetts. Description: 2008 Seaswirl 2601 26’ 10 passenger Walk Around; powered by twin 2008 Evinrude (Etecs) 150 HP Motors; 2012 Load Rite trailer. All cushions benches included; enclosure with drop curtain; snap-in cabin carpet; dinette table in a cabin; sleeps two; enclosed head, sink, and burner. Equipped with live wells; fresh water hold; salt water wash; Garmin 740S 7” GPS Touch Screen Chartplotter; GMR-18 HD 4Kw 18” High Def Radar Dome; B60-20 Tilted Element T.H. Transducer; Blue Chart G2 Vision Card; Garmin VHF 100 Radio; Shakespeare 8” VHF Antenna; Surround stereo system. All electronics purchase new with the boat in 2012.